It is important to stand up for Sarita Devi in her struggle today. Not only because cricket legend Sachin Tendulkar has backed her and urged government to fight her case but also because in spite of so much imbalance in sports favoritism in our country (sadly, we can even die for cricket!! ), such athletes and sportsperson are able to bring laurels to our nation. We need to give them their due importance which we have reserved only for cricketers, at least during such times. 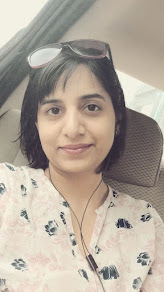 Through this article I voice my support for her to tell her that I empathize with her pain and that her genuine tears were nothing to be ashamed of. Sarita Devi is from Mayang Imphal who turned professional in boxing in 2000, inspired by the achievements of Muhammad Ali. She represented India at the 2001 Asian Boxing Championships in Bangkok, and won a silver medal in her weight class. Following this victory, she won medals in various tournaments, including gold at the 2006 World Championships in New Delhi and the silver medal at the 2014 Commonwealth Games in Glasgow. She is sixth of eight siblings to her parents and used to spend her time helping her parents in collecting firewood and in the fields, which helped her build the stamina she has today. Devi entered the semifinals of 2014 Asian Games in Incheon, South Korea to face South Korea's Park Ji-Na on September 30. After the match, she was handed a controversial 0–3 defeat verdict by the judges of the match, considering that Devi had knocked Park out in the third round and also a convincing fourth round, before having rained heavy blows on Park throughout the first two rounds. The Indian team lodged a protest against the decision, which was rejected by the AIBA's technical committee. 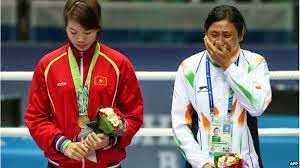 At the medal awarding ceremony, deeply hurt and crying Devi refused to accept her bronze medal and handed it over to the silver medalist, Park. However, she accepted the medal later. This was followed by provisional suspension of Devi and her coaches by the AIBA, barring from participating in the AIBA's events until further notice. 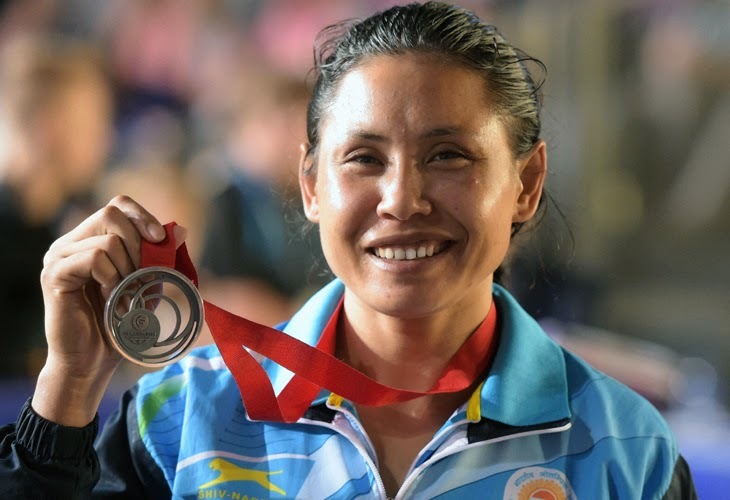 AIBA President, Wu Ching-kuo has said that Sarita could be given heavy punishment for refusing to accept the bronze medal at the Asian Games. Why I would like to stand for her? First and foremost - voicing out dissent in a world where conformation is what is expected of powerless people at large is something worth applauding. What she did in her angst might not be the best or the right way to express what she went through. But she did take a stand against bias. We must not forget that she is still human and humans make mistakes. Her mistake was in method - not intent - and it is that intent I fully support. We are tuned to accept injustice all around meekly. Injustice which is subtle - but keeps on happening, keeps on repeating. A car jumping lanes, driving wrong side, jumping signals - all these are small examples of injustice. Paying bribe to register property, contractors building poor quality roads so as to get repeat contract again are examples of injustice. But "chalta hai" attitude makes us bear with all this and more. I express solidarity with Sarita in her struggle for being respected, and being allowed to be what she truly is - a sports(wo)man - to express true sportsmanship by playing harder, and coming back leaving all controversies behind. Whatever, I still do not agree with her conduct. It was wrong. umm I would say it could have been graceful.. it was emotional and can happen to anybody.. She should have been counseled and not banned.. banning her is too extreme esp. when the decision appears to be controversial..
We are emotional people, when you come from a humble background and put in all you have and then face a situation like that it is possible one may react that way. I support her for it. Having said that what India lacks is providing counselling of handling various situations. Like in modelling, the candidates and groomed to face various scenarios in each field it is important. I am a believer of whatever happens happens for good, if she wouldn't have reacted like the way she did, today the world wouldn't have taken it so seriously and we wouldn't be debating about it, it would have been long forgotten. An applause from me to you Roohi for this article. I second your thoughts, Shweta. Sadly, all such facilities are there for Indian Cricket team but not for other sports. But definitely everything happens for a reason and good..
amazing post roohi!injustice should be answered back! I just pray Sarita gets to perform with dignity.. I totally support Sarita Devi. Great that you shared. Please do write about her, Anita. We need to build the noise for just causes to reach the deaf ears..